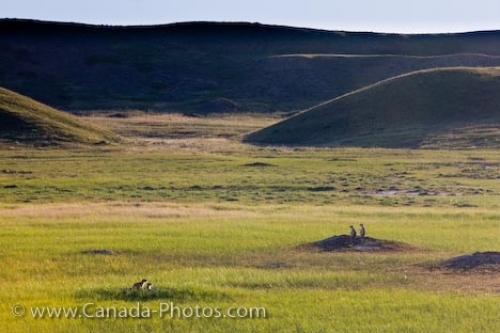 Popping up across the landscape atop their burrows in a place called Dog Town in the West Block of Grasslands National Park in Saskatchewan, visitors can view the Black-tailed Prairie Dogs. Dog town is a place where approximately 25 colonies of Black-tailed Prairie Dogs live amongst the dry, short grass of the West Block. An important species of animal in Grasslands National Park which aids in keeping the ecosystem balanced. The early morning hours are when these animals come out to feed before continuing on with their chores of socializing, grooming themselves, dustbathing or building or repairing their burrows. Generations of Black-tailed Prairie Dogs reside here along with their burrows which are handed down to the siblings as the parents move on to build a new home. Dog town in the West Block can be a busy place during the daylight hours where visitors can watch the Black-tailed Prairie Dogs go about their business. Picture of the Black-tailed Prairie Dogs in Dog Town in the West Block of Grasslands National Park in Saskatchewan, CAnada.